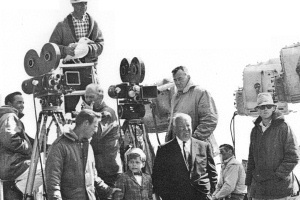 The late Jim Brown (1930-2011), Hitchcock’s Assistant Director (left of Hitch in the picture, holding the child actor) on The Birds and Marnie, was interviewed on tape in his home in Angels Camp, Northern California, about working with Hitch. Now for the first time, a portion of the unedited interview is published which contradicts his portrayal (played by Carl Beukes) in the Emmy nominated The Girl. “Some of the things that are expressed about Hitchcock was highly over exaggerated. I think Hitch became upset because he thought Tippi wasn’t fulfilling the starquality that he thought she had or was looking for. After the preparation he was just fulfilling the obligation, so he’d be falling asleep when we were shooting. Tippi he took through every word, every line. Tippi got his full attention. I think he got a little bored with the project (Marnie), but I didn’t see much difference in his behaviour between Marnie and The Birds. Hitch didn’t like being in the elements, he stayed in the car alot in The Birds. The Birds was more complex, we had children and animals to work with. I had the pleasure of getting close to him as anyone else had because we worked on both pictures back to back. When it came to work he kept pretty much inside himself. I didn’t like working on the stage that much, my background was early television doing westerns, I loved working outdoors. Anytime you’re on the stage got claustrophobic. Tippi and Hitch had their differences on Marnie, but I don’t think that there is any – there were some tensions between the two of them that you could feel on the set that permeated through the cast and crew. Maybe Tippi didn’t get as much direction at times as she could have done. But Marnie was a cinch compared to doing Dallas (Jim Brown was line producer for three years from 1985). . .they were already wealthy, established multimillionaires. And none of them wanted to come to work they all wanted to go out and open grocery stores for $150,000. When Bob Burks was ready, he’d give me a nod, and say 5 minutes, or sometimes he would nod and then I’d walk to Hitchcock’s portable dressing room on the stage, and knock on the door if it’s closed, or poke my head in. I started in 1953, in the mailroom, started in the business at the age of 23, 25 when I became a second AD, first AD director at the age of 27, I directed a couple of Wells Fargo Westerns then worked with Hitch when I was 32 years old. Same age as Tippi. In 63, I was 33, and Tippi was the same age also. Hitchcock was the greatest boost that anyone could have in his career. The mere fact that he chose me to work with him as his AD, Everyone else in the business thought I was good. His reputation rubbed off on me, and it became a tremendous boost in my career. Hitch used fixed lenses he rarely used a zoom lens. He used to play games with me. He say where are we cutting the girl, where’s the size of this two shot? So by looking at the distance where the camera was to the distance the person being photographed. He’d train my eye to a 50 mm lens which he used most of the time, and it gave me a lot of confidence for looking through the camera. He was an absolute genius with the visuals. I was much more pleased with the conclusion of The Birds, there was something special about it (compared to Marnie). But I didn’t feel Marnie was that special a project. I certainly wouldn’t rate Marnie among his better projects, comparable to some of his other works like To Catch A Thief, and Rear Window. It wasn’t the lack of stars. Sean and Tippi did a marvelous job. Because the way it was shot, process and backgrounds, at a time when commercials, were a lot more interesting, motion pictures were being shot on location, different techniques, was too old fashioned, there was a breakthrough at that time when movies for television were being made, they were more exciting than that type of motion picture which was old fashioned. I didn’t think that Hitchcock would ever make a picture that wasn’t going to be commercial. He made Psycho for 700,000 dollars and I think he felt his obligation for Universal and himself to make pictures that were successful. He never expressed that he wasn’t pleased with it (Marnie) to me.